At Kilkieran Co Kilkenny are three Sandstone crosses and the fragments of another high cross. These crosses are part of the Ossory group, which includes the crosses at Ahenny, Killamery and Kilree. The west cross, or decorated cross pictured right, is probably the most important and is very similar to the crosses at Ahenny. On the eastern side of the base there is some figure sculpture showing eight horsemen, the rest of the cross is mainly covered with celtic interlace but it is unusual, in that some of the interlace on the base is imperfect, which is very rare on high cross sculpture. This cross also has the conical cap we associate with other crosses in this group and is also interspersed with bosses. The cross stands at 3.55 metres high. 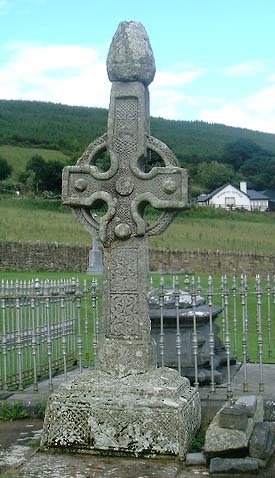 Pictured above is the north cross which is quite unique in its shape, it is tall and slender, has short arms and no ring. It stands at 3.5 metres high and bears traces of decoration. These crosses date to around the 9th century. The plain cross, pictured below, although the same shape and design as other crosses in the group this cross is plain and bears no decoration.This cross is about 2.80 metres high. 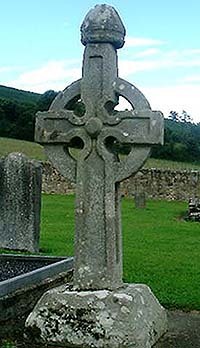 Situated: In a Graveyard in Kilkieran, County Kilkenny. From Carrick-on-Suir take the R 697 North, after 6 kilometres take a right turn onto the R 698 towards Owning, the graveyard is about 300 metres down this road on your left. Discovery Map:75 S 4214 2753. Last Visit: Jun 2003.